Vintage Polychrome Faceted Clip On Earrings And Ring Set. Vintage polychrome faceted rhinestone clip on earrings and ring set. Vintage sparkling faceted poly chrome earrings and ring set. The earrings and ring are formed in a complimentary designs, featuring a large faceted poly-chrome stone, set in textured silver tone cup settings. 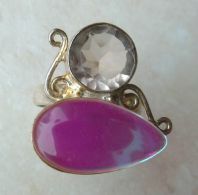 The ring is adjustable, the earrings have a strong clip on mechanism to the backs. 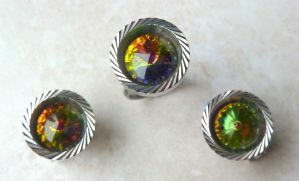 Earring size is approx 1.8cm in diameter. Secure clip on mechanism to the backs. 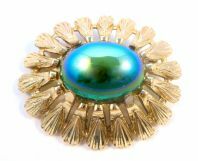 Vintage large raised polychrome cabochon brooch in textured gold tone setting. Vintage Oval Shaped Polychrome Clip On Earrings. Vintage, oval shaped, marquise polychrome rhinestone set, clip on earrings.